Homeowners are always looking to maximize the usable area in their homes and probably the most popular idea to do so is utilizing the loft more creatively. Well! It is possible to create a storage unit in this space where things can be used in a very innovative manner. Indeed, fitted loft wardrobes can help you to make your home look more beautiful and well organized. Often lofts are cluttered with unwanted toys, cartoons, clothes, documents and other unused items. But the fact is that this space can also be converted into a comfortable living space. One of the most demanded solutions is creating a walk-in-wardrobe. You can choose drawers and hanging spaces to place your essential items. A walk-in-wardrobe is the dream of probably every men and woman. By creating such a wonderful storage space in the loft, you can enjoy luxury and convenience. Bespoke closets can be used for storage clothes, shoes and accessories as well. One can make this space more beautiful with some additional arrangements in the form of lighting, mirrors and dressing table. This extra space in your house can serve like most welcoming area for your guests and kids as well. When you are ready to get a slopping ceiling closet you might find, that it is hard to find the wardrobe that would fit. Professionals can help you to design a wardrobe that suits your taste, preferences and lifestyle. Another popular way to make the attics appealing is to create a games room for kids in the loft. Built-in closets can help you with this as well. You can store all toys, game consoles, board games, puzzles, crayons etc in the made-to-measure drawers, cupboards and fitted shelves. 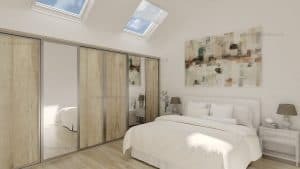 To make the best out of the loft wardrobe, it is first important to hire some trained and experienced professionals from bespoke wardrobe company. We can help you create a most wonderful and most useful structure with a unique piece of furniture. You can use modern loft wardrobes to meet your everyday storage requirements.